The story of Sherman and Ann Barnes (above) is a testament to the deep attraction that Wysox Township holds for so many families. They maintain a joy of country living that endears them to their neighbors and other friends. Known to many as sheep farmers, the Barnes’s history in the area is multi-layered and literally woven into the fabric of the Township. 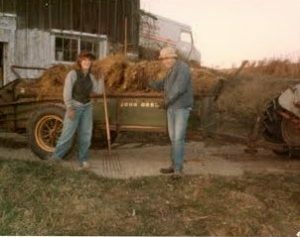 Barnes Acres on Hollenback Road in Wysox Township has been actively farmed by the Green and Barnes families since 1858, garnering the long-term venture Century Farm status, officially, since 1979. Whether milking cows and keeping chickens, herding sheep, or planting trees and picking apples, the Barnes family has become a mainstay of the country “neighborhood” known as Pond Hill. 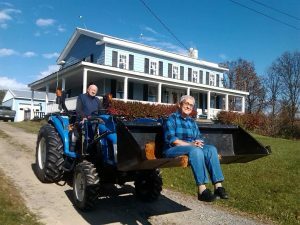 Sherman and Ann Barnes have lived in the big blue house on the hill since 1971, after living for 17 years on nearby Schmieg Road. Sherman admits that he has never ventured far from 126-acre spread and the house in which he was born in 1930. His sincere love for the land aside, Sherman explained in a November 2015 interview that the very nature of farming has always kept him close to home. Sherman Barnes was the third of four children of Howard and Helen (Dixon) Barnes. Howard’s father, also named Sherman, married Sofia Green in the 1890s and had five children: Ned, Lewis, Howard, Frank and Amanda. Howard was born in 1898 and married Helen Dixon of Towanda. Like his father, Howard spent his entire life on the family homestead. For Ann, the attraction to Pond Hill and Sherman began as a youth, when her family owned a cottage on Lake Wesauking. Ann was born in Shamokin in 1934, the daughter of Russell and Sarah (Hoover) Jones. The cottage that was purchased as a “getaway” for the Jones family became a bit of an obsession. “My father loved it up here,” Ann related. So did other members of Ann’s family, several of who also moved to the Wysox area over the years. 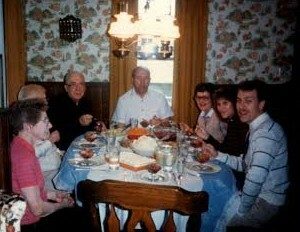 Ann and Sherman were married in Shamokin in 1954 and moved into a house on Schmieg Road that Sherman had purchased in 1952. Ann’s sister, the late Dorothy Jones, married Wysox Township resident James Schmieg. Her sister, Mary Lou, married Ralph Snyder of Shamokin, from which they moved to the Lake Wesauking area. The Snyders have also passed away, Ann noted. In fact, the family lost five members in 2014 alone. While Ann’s knowledge of her lineage is fairly well-entrenched and more easily recalled, Sherman wishes that he had kept better records of his ancestry. 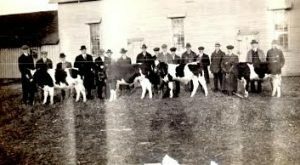 Certainly, for many years the homestead was operated as a dairy farm for profit. The family also raised pigs, chickens and a wide variety of garden crops for sustenance. Sherman was told that his grandfather was suffering from a bout of pneumonia when a local farmer who needed his horses re-shod stopped by. “He got up and shod those horses and died a few days later,” Sherman explains, and left his wife to raise their five children and run the farm. Howard (below) had a failing heart, in an era when cardiopulmonary medicine and care were in their infancies, and died in 1955. “All they had back in that time was an electrocardiogram, which just told you how bad you were,” Sherman recalls. 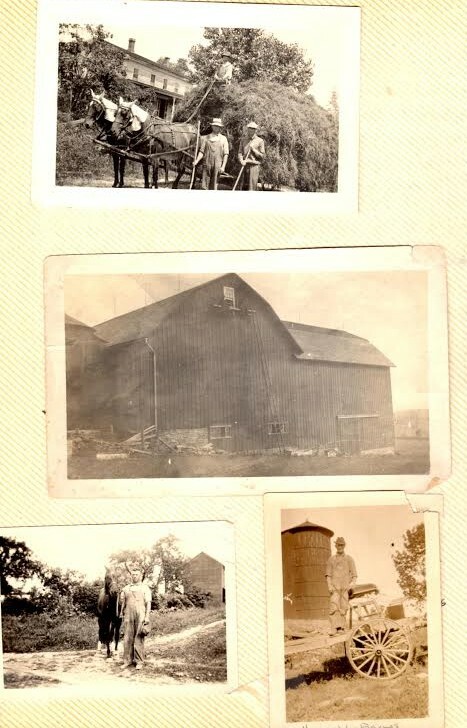 Despite the losses, Sherman has countless fond memories of his life on the farm, including the days when siblings Shirley (who married Warren Barlow), Betty (Jim Wilcox), and Gerald (Claudia Cutler) were an integral part of the operation and when Howard was still running the farm. 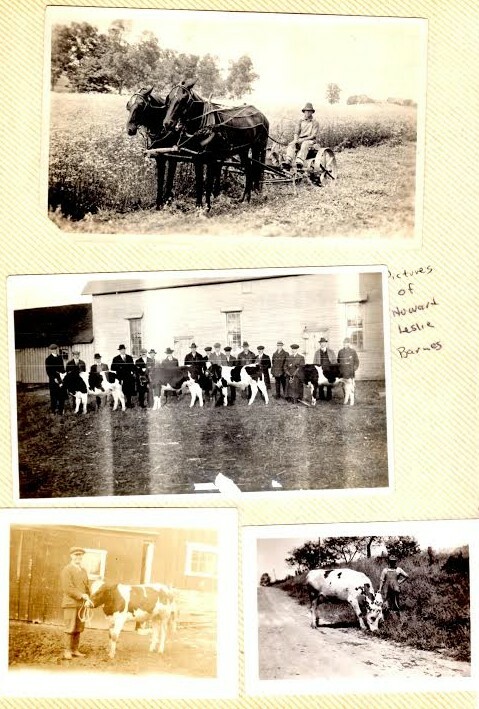 After the elder Sherman’s death, Howard had settled the estate with his siblings and took over the dairy operation, operating about 27 head of cattle until his own death at the age of 58. Sherman and Ann had more than 700 chickens of their own to keep them busy when they got married. They had already been helping to milk Howard’s cows and continued to do so until the herd was sold off in 1964. 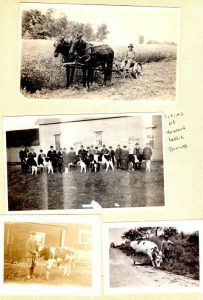 The Barnes took an interest in raising sheep in the late 1950s after local farmer Allen Drake presented them with a lamb. “I decided that I liked it so much that I wanted more,” Ann says with a laugh. Wool produced by the Barnes’s sheep would eventually garner first-place ribbons at the Troy Fair. Soon they were driving 140 sheep annually about a mile to George Smith’s pastures for summer grazing. “We only got 134 back one year because the coyotes got at them,” Sherman related. Smith himself had at least 200 sheep, they recalled, and later sold his farm to Bob Veleker. 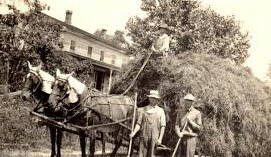 In addition to hunting deer and small game, Sherman and Ann also maintained an extensive vegetable garden, orchards, and fields through which they rotated corn, oats, and hay. They continue to hay fields today with the help of the neighbor Dan Reed and his family. Sherman and Ann had two daughters; Gwen, who married Kevin Sheehan and works for the Towanda School District; and Joan, who married Will Dinse and resides with him at Langley Air Force Base. 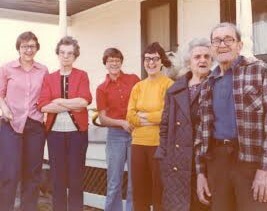 Sherman’s mother, Helen, invited Sherman and Ann to move from Schmieg road back into the old family house in 1971. “She got so she was afraid to be here alone,” Ann explains. “She was glad that we were remodeling the house. She loved it when we were finished.” Helen passed away in 1996 at the age of 94. Ann’s mother passed away in 1994. The sheep that so were iconic to local residents for decades were sold off in 2004. 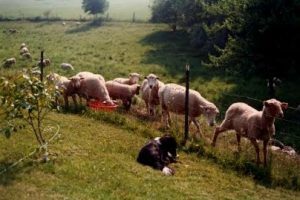 Ann admits that the couple does occasionally consider bringing a few sheep back to the farm, but they are content in the meantime maintaining their gardens and orchards and looking after more than 475 hardwood trees they planted across the property as part of the Conservation Reserve Enhancement Program (CREP). They are planting a riparian buffer with guidance from the Bradford County Agricultural Conservation District to reduce farm runoff and stream sediment in the greater watershed. “The program is beginning to show success,” Sherman noted. “They say that the Chesapeake Bay is cleaner.” Initially, Sherman noted, the property drains into Lake Wesauking. “We enjoy working with trees,” adds Ann, noting that all have survived except for approximately 85 ash trees that succumbed to ash borers. Their official commitment to CREP is about to expire, and Sherman is unsure whether to renew their contract as it restricts the ways in which the acreage can be used. “There are farmers looking to increase the size of their herds, and they need land,” he stated, suggesting that he would like to see the fields planted again. They are hopeful too that one or more of their seven grandchildren and five great-grandchildren will show an interest in reviving the farm. (They have another great-grandchild on the way in April 2016). The family had spread out for a while, but Sherman and Ann sense that the land they hold so dear might yet draw the family back together. Despite changes in land use, Sherman and Ann see the rest of Wysox Township changing at a far greater pace than their homestead. Even the natural gas boom had minimal effect on their lives on the farm. 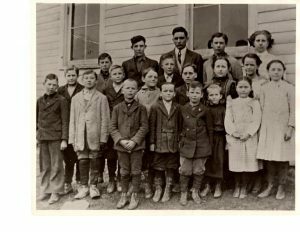 In addition to their family history, Ann has an impressive collection of stories and artifacts pertaining to the Pond Hill community, which at various times supported both a school and a church. The church, Sherman related, was dismantled in the 1940s, loaded onto wagons and moved to North Rome, where it was reassembled. 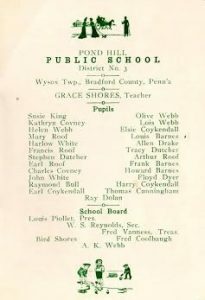 The student body of the Pond Hill School was eventually merged with Wysox School, where Ann worked for 25 years as a secretary until her retirement in 1992. With the help of the Bradford County Historical Society, Barnes Acres was recognized as a Pennsylvania Century Farm in 1979, It has now been in operation for 158 years. Pages from the Barnes family photo album offer a glimpse into a heritage steeped in agriculture. The Barnes’s adult children have been coming back to the farm for years to pitch in with the chores. An undated photo of the Pond Hill School student body and staff includes several Barnes children. A class list from the Pond Hill School names Sherman Barnes’s father Howard and uncles Frank and Louis among the pupils. The head teacher at the time was Grace Shores, while the school board president was Louis Piollet. 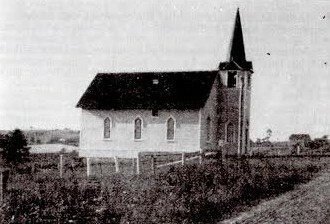 The Pond Hill/Lake Wesauking Church as it appeared before it was dismantled and moved to Rome Township.